Luigi Filippo Tibertelli, known as Filippo de Pisis, was born in Ferrara on May 11, 1896. The required trip to Venice for the military visit, following which he is reformed, allows him to open his eyes to the colours of the lagoon and its greatest artistic figures. Later he moves to Bologna, where he attends the Faculty of Arts, approaching the futurist poetry, and then establishing relationship with Marino Moretti, Umberto Saba, Giorgio de Chirico and his brother Alberto Savinio and epistolarily with Soffici and Tristan Tzara. Back to Ferrara he depicts some metaphysical compositions and landscapes of the countryside. In 1919, as part of the Ronda group in Bologna, he knows Cardarelli and Morandi. In March 1920 Casa d’Arte Bragaglia organizes his first exhibition. 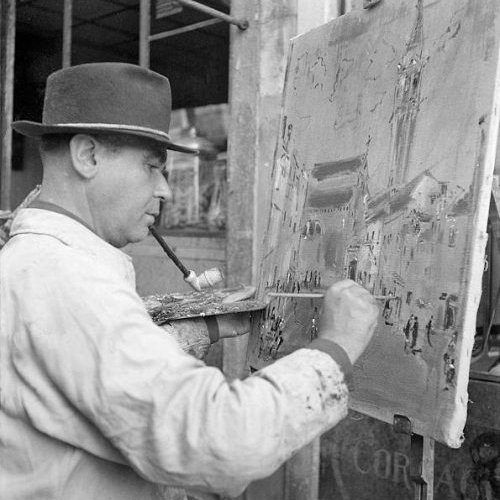 Ferrara does not satisfy him anymore, and he moves to Rome, deciding to devote himself to painting; here he befriends the painter Armando Spadini and frequents the environment of Valori Plastici. Staying in Rome marks an important moment in the life of de Pisis, both for the evolution of his painting and for his cultural choices. In this period he works to define his own figurative language, beginning to develop his characteristic still-life paintings. He participates in the III Rome Biennale, in early 1925, displaying side by side with De Chirico and Donghi. In the same year he leaves for Paris, where he paints a lot – Parisian views, free copies from the ancient, still life, flowers, studies of nudes – overcoming the impressionist lesson. His works, exhibited throughout Europe and welcomed in major galleries and art shows, reach maximum success at the Venice Biennales of 1948 and 1954. He paints until 1953, then his precarious state of health does not allow him to work anymore.